This SafeWaze M2050 3-Way Complete Recovery System is a fall protection, retrieval and rescue system ideal for confined space entry. 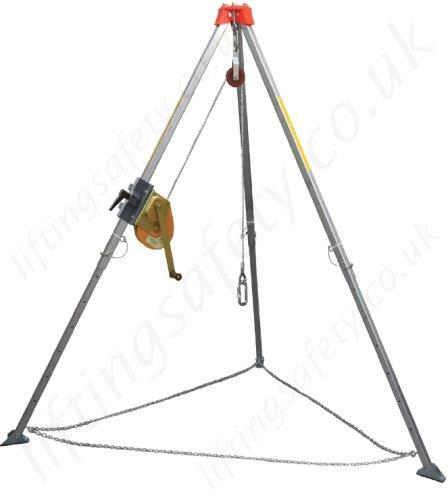 This system utilizes a self-contained three-way retractable 50' lifeline with a built-in winch for retrieval and lowering, the tripod features a durable and lightweight aluminum construction with adjustable telescopic legs that will reach a maximum height of 7' and are connected at the bottom by a durable chain for enhanced stability. The SafeWaze (P/N: 142G) 65' Pesonnel System Hand Winch is a useful accessory to the M2050 System and (P/N: 4700) a Black SafeWaze Tool Bag is perfect for carrying, storing and organizing the SafeWaze 3-Way Complete Recovery System. Winches and Tool Bag sold separately. Recovery Systems sold individually. * Please call us with any questions about our tripod evac kit w/65 foot cable rentals in Kamloops BC, Princeton BC, and Salmon Arm BC.